The GT classes of sports car racing offer some of the most exciting and diverse forms of Motorsport, with many road-based cars of different specifications often sharing the track at the same time. This leads to great racing, but understanding the differences between them can be difficult. Here I will attempt to differentiate between the GT classes, so that you may enjoy the sport more fully. For the sake of clarity, we will stick to classes that currently exist. Attempting to research/explain GT classes before this point will get fairly confusing. I know this because I initially tried, and I got a headache. GTE is currently the highest level of GT racing, and is further split into two levels, Pro and Am. GTE-Pro is largely defined by manufacturers and factory backed teams, and GTE-Am is for privateers. GTE-Am cars are required to be at least one year old or made to the previous year's specification. 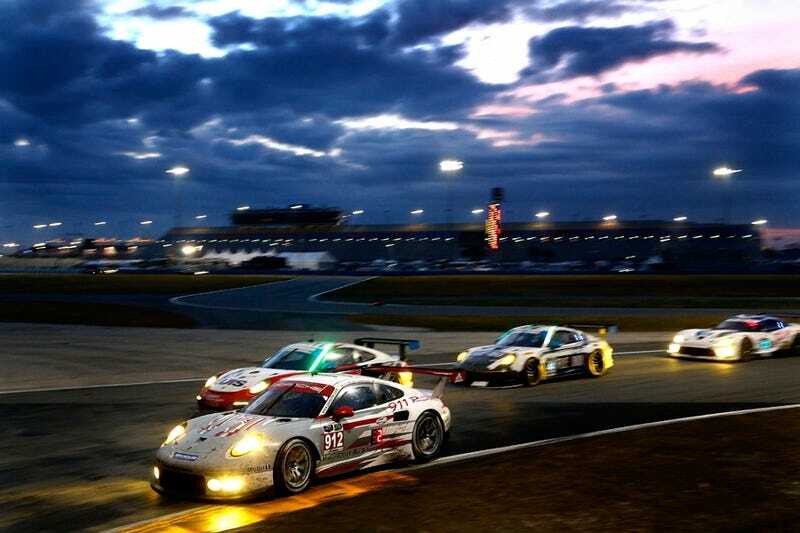 This category was called GT2 before 2011, and is called GTLM in the United SportsCar Championship. GTE cars must meet certain specifications designed to keep them closely related to the road cars they are based on. This is known as homologation. In order for a car to qualify, a large manufacturer (like GM) must produce at least one road going version of the car per week, or one car a month for small manufacturers (like Ferrari). These cars must also be available for sale, with an official launch campaign for the road car and network through which the car can be sold. The cars must have only two doors, a two or 2+2 seating configuration, and have bona fide sporting ambitions. The car is not required to use the engine it is offered with (although it usually is), but it is required to be a production engine used in a road car. Carbon fiber, titanium and magnesium cannot be used outside of parts like spoilers and wheels, unless the road car has a carbon cockpit. All cars are rear-wheel-drive, and engine-based traction control is allowed. Also, in an interesting nod to the Le Mans era of old, every GTE car is required to have 150 cubic decimeters of luggage space. How Much Does a GTE Car Cost? Cars in this spec will cost you about $750,000. These cars have all been homologated for use in GT3, in alphabetical order. Some are no longer in use, but are still technically legal for use in GT3 races, even if they are not necessarily competitive. Those that have had their homologation expired are noted as such. How Much Does a GT3 Car Cost? There are many more racing series that use the GT4 class or feature cars built to this spec, so if you know of any more, let me know. How Much Does a GT4 Car Cost? For the price of an exotic road car, you can get yourself a race ready GT4 car at around $250,000. I hope that this helps you understand the current world of GT racing a bit more. Sometime in the future, I'll write a post about how GT racing got to this point, but this is how it exists now. I did not include the Japanese GT500 class of Super GT and German DTM as a part of this guide, because those cars are Silhouette cars; while they may look like their road going counterparts, they actually have carbon fiber monocoques and tube frames, and share as much in common with their road going counterparts as Australian V8 Supercars. I love racing and cars. I talk about that a lot on Twitter. Feel free to follow me at @willkinton247. If you want me to look into a particular series or topic, or have any feedback, let me know!